Dreams to create a public riverwalk to Willamette Falls will have to remain on hold for at least a couple more years. Construction on the project envisioned by thousands of citizens in workshops was supposed to break ground this year, but now public partners are staring down the barrel of an April deadline to lose $12.5 million in state funding as they add the tax man to the list of creditors knocking on the door of the developer at the former site of the Blue Heron Paper Co. mill in Oregon City. According to the Clackamas County assessor's office, George Heidgerken's Falls Legacy LLC has a "delinquent" account and the company didn't pay property taxes for 2016 or 2017. His company owes more than $46,300 in back taxes, which includes thousands of dollars in interest, on the properties related to the 23-acres of prime real estate next to Willamette Falls. Heidgerken dismissed the delinquent taxes in a recent interview with this newspaper. County officials say state laws allow for four years of delinquent tax payments, so the earliest foreclosure proceedings would begin is May 2020, with actual foreclosure in 2022. If he makes payments on what he owes for 2016, that would push foreclosure proceedings another year out. According to court records, over the years Heidgerken has dealt with several federal tax liens, which were the U.S. government's legal claims against his various properties when he previously failed to pay tax debts. "I'm so used to this that it's fine," Heidgerken said. "I can guarantee that our taxes will be paid." Brian Moore, Metro's Willamette Falls Legacy Project manager, said the revelation of Heidgerken's tax debts on the property adds to the concerns of the four public partners on the project. "Individually it could be a minor issue, but as part of a suite of issues — many of which we identified in September — it doesn't give us any assurance or reassurance that the property owner wants to move things forward," Moore said. "The position we're in is quite tenuous." As previously reported, Heidgerken's company also failed to make a $200,000 payment by Metro's January 2017 deadline for work leading to redevelopment of the area for business expansion. 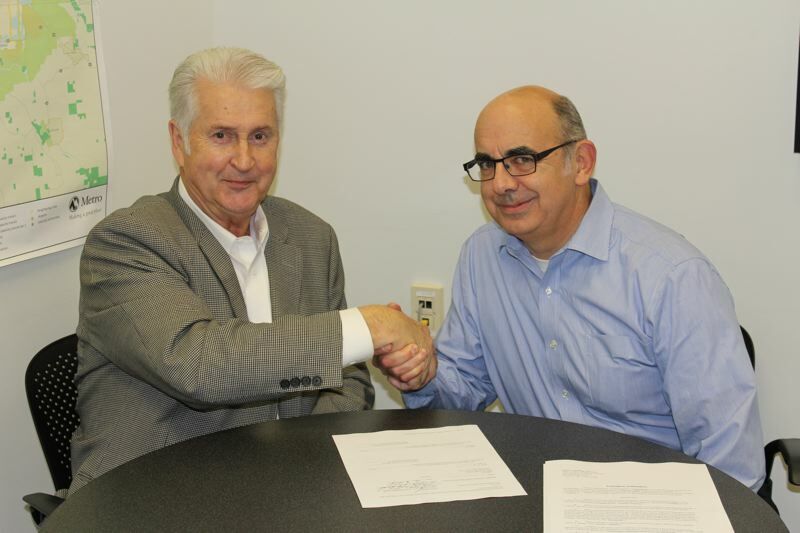 He signed the agreement in 2014 to contribute a relatively small portion of funds to the public walkway. Last September the four governments involved — Metro, Oregon City, Clackamas County and the Oregon Parks and Recreation Department — went public with their complaints. "They overstepped their bounds in terms of what I gave them," Heidgerken said. "We're working on some things with Metro and the city that rectify some of the issues." Moore said the public partners have "stuck to the agreement," even bending over backward in an attempt to address some of Heidgerken's concerns. Local governmental agencies say Heidgerken's plans for private development will benefit from the $25 million public investment. The public riverwalk is envisioned to spur private development by drawing people to Willamette Falls and transforming the site into a scenic destination. A vibrant extension of downtown OC to the south is expected to blend homes, shops, businesses and perhaps even a hotel or light industry. But without the cooperation of Heidgerken's company, Metro can't apply for the permits needed to get the riverwalk project started. "I hope that Mr. Heidgerken sees the value of the public investment," Moore said. In the 2014 easement agreement, Heidgerken said he "shall cooperate with Metro" to sign a riverwalk permit application to the state of Oregon and the U.S. Army Corps of Engineers. It was presumed that the riverwalk was built with public funds, but an alternative scenario now is being discussed. An open-space requirement for any developers along the Willamette River includes a greenway trail along the Willamette Falls site. In addition to the greenway requirement, the recently approved master plan for the former paper-mill site calls for the construction of the riverwalk in order to get permits for construction of private buildings at Willamette Falls. If Heidgerken misses the deadline for state funding of the riverwalk, he or any other subsequent developer of the site would have to build the riverwalk without any public investment. "Unfortunately, George Heidgerken seems to have changed his position, and he no longer sees the value added of the public investment," Moore said. "What will happen is that private development will build the riverwalk at its own expense and Metro will purchase the open space for $100." In December 2014, Falls Legacy signed onto a 120-foot-wide waterfront easement for the riverwalk. Heidgerken also committed to pay $700,000 in stages — $200,000 up front, $200,000 in January 2017, and three $100,000 payments at various milestones as the project is completed — and at least 20 percent of the future maintenance and operation expenses of the riverwalk. Heidgerken said he didn't make the $200,000 payment in January 2017 because he realized he had a raw deal. "I gave them, free of charge, an easement for the property," Heidgerken said. "They should have paid me for the walkway." Since signing the deal with Metro, Heidgerken said he has talked with two attorneys, one in Portland and one in Seattle, and both told him independently of each other that he "gave up too much." When asked if he meant too much of the width of his property for the public-walkway easement, he said the issues were too numerous and complicated to discuss with a newspaper editor. "It wasn't just about width; it was about a whole bunch of stuff," Heidgerken said. "It's about defending private property rights. Would you rather have a big park there or would you rather have ongoing businesses, restaurants and such, that provide jobs?" Moore said Metro worked with Heidgerken to allow for an additional development parcel on top of the easement, but it wasn't enough of a concession for Heidgerken to stop holding up the project. "He gave us significant property rights with the donation of the easement, and we're very grateful for that," Moore said. "Mr. Heidgerken often points out to us that economic redevelopment is one of the core values, and we agree, but in order to get there we have to get signatures for our permits." Falls Legacy expressed concerns about trees potentially blocking views of the river from the private development, Moore said, so Metro drew up a separate agreement with the developer that was designed to address the issue. "When it came time to ink that agreement, it was insufficient," Moore said. As for the concern about width, Moore said the process for establishing the final width is spelled out in the design process in the easement, and Heidgerken will have plenty of other opportunities to address the concerns about development parcels as the riverwalk moves from a conceptual design to a final architectural rendering. 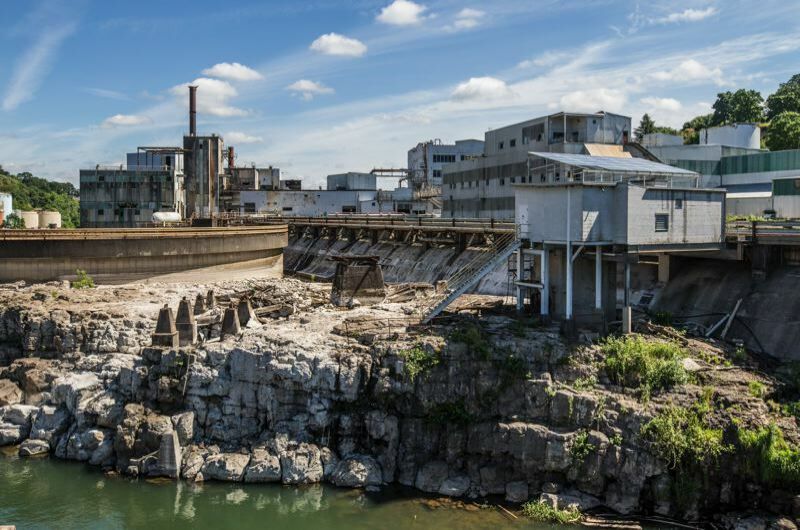 Developing under the best of circumstances, Moore acknowledged, with a complicated site like a former industrial complex next to Willamette Falls, "it's going to get messy and difficult" and ultimately there will be changes. "In order for us to move to the next stage, we need the signed permits," Moore said. "A lot of Mr. Heidgerken's design concerns could and should be addressed after we get the permits and go into the final design stage." If the property owner holds up the process forever, state funding would dry up, and the efforts and funding that already have gone in to the plan would be in vain. Metro is prepared to wait it out until there's a compliant property owner, however. Conceptual planning began in the winter of 2015 and since then, thousands of Oregonians participated in meetings, events, attended presentations and tours, provided feedback and shared their vision for the future riverwalk. "The remarkable coalition of experts putting this together wouldn't be possible without a strong partnership," said Oregon City Commissioner Nancy Ide. Metro and state officials said at stake are two issuances, $5 million and $7.5 million, of lottery-backed bonds from the Oregon Legislature as part of the $25 million amassed for the first phase of the project. About half of that $25 million comes from state sources, and a nonprofit group hopes to raise $8 million through private contributions by 2022. Construction was scheduled to begin in 2018, but this year will surely pass without any groundbreaking on the riverwalk project. If Heidgerken miraculously signed the permits tomorrow, it would take an estimated 24 months from that point, or February 2020 currently, before the project could break ground. "State funds expire in April of 2020, and that's why we're in a tough situation," Moore said. "We expressed that to him last year, and we reiterated that to him in September. I hope he understands that we're serious and that we're not trying to twist his arm into something." Heidgerken said, "You can paint your house any color you want, and I can do anything I want with my buildings as long as I get a permit." Will the state reallocate public funds for the riverwalk if Heidgerken hasn't signed the permits by April? "They haven't given us a hard date, but it looks as if it would be in or around April," Moore said. "This project is important to a lot of folks, so there's certainly been hesitancy about putting hard lines down. There would be an incredible amount of disappointment if we were to lose those funds, and that moment is rapidly approaching." Public agencies are continuing forward with plans, despite the landowner's lack of cooperation with the agreement he signed in 2014. Oregon City's city commission adopted the Willamette Falls Riverwalk master plan at its Feb. 7 meeting. This followed last month's Metro Council adoption. "We believe that this is a critical investment to make the riverwalk accessible to folks so for the first time, as Mayor Norris said, in 150 years people can access the falls," said Clackamas County Commissioner Martha Schrader as Oregon City commissioners adopted the master plan on Feb. 7. Moore said there is no contradiction between elected officials' publicly optimistic statements and their worries behind the scenes that the developer won't allow the project to be built as envisioned. He said it remains true that officials are excited about the potential, even if they're concerned about completing the project anytime soon. "The riverwalk design needed to be established, and we received this very generous donation at a time when nobody knew what the riverwalk would look like," Moore said. "Now that we have a design concept that the four public partners agree on, we're ready to move forward." The approved master plan for a riverwalk includes gathering spaces, a public boat dock and other amenities aimed to bring visitors up close to North America's second most powerful waterfall. Public partners were concerned about Heidgerken as he bought the Blue Heron property in May 2014. In addition to liens he's gotten for not paying taxes, Heidgerken has faced federal charges back in 1993 for illegal storage and transport of hazardous materials. Before he paid $2.2 million in bankruptcy court, worried local officials tried to stage a bidding war, but they couldn't raise the funding for an eleventh-hour attempt on this important 23-acre property right on the edge of downtown. Local officials expressed optimism in working with Heidgerken following his bankruptcy-court purchase. But Heidgerken's behavior in the past year seems to have borne out the validity of the initial worries. "The biggest mistake we made as public agencies was not buying the property," Oregon City's City Manager Tony Konkol said in January 2017, as Heidgerken refused to make his second payment. As previously reported by The Olympian newspaper, Heidgerken encountered regulatory problems that led to a federal felony conviction. In 2000, the Clackamas County Circuit Court ordered Heidgerken to pay a $338,758.38 foreclosure judgment to J. Frank Schmidt & Son Co., a Boring-based nursery. Also in 2000, the state of Washington's Department of Natural Resources fined Heidgerken $10,000 because of his failure to comply with a Forest Practices Act reforestation order. Heidgerken completed the harvest of 270 acres in mid-1990 and yielded more than $2.3 million in gross income. State officials said it would have cost between $16,000 and $20,000 to reforest the land following the harvest, but Heidgerken reforested only about 50 of the 270 harvested acres. Heidgerken pointed out that he has many different projects and his own style with each of them. "I'm active on the properties that I own, and I have a lot of them," he said. "As far as doing things, I like the positive aspects, not the negative things." • In November 2016, he bought 427 acres on the Oregon Coast two miles north of Reedsport, reportedly paying $3.3 million. • In May 2013, Heidgerken bought the former Abitibi paper mill in Steilacoom, Washington, on Puget Sound and adjacent to the Chambers Bay golf course, site of the 2015 U.S. Open. • In 2010, Heidgerken and a partner, Patrick Rhodes, paid $1.4 million in cash for the 200,000-square-foot former Olympia Brewing Co. brew house, 32 acres that surround the building and two parking lots in Tumwater, Washington. Heidgerken said he's considering walking away from the Willamette Falls project to focus on his other three big projects. "We've had options to sell the property many times," he said. With the $12.5 million in jeopardy, why haven't the public partners sued the developer for lack of compliance with the agreement? Moore said there has been some disagreement among the four public partners whether to file suit. "The public entities are in a four-way partnership, and the decision-making process is based on consensus of the four," Moore said. "We hope there are other remedies and other paths to help Falls Legacy to get on board." Despite their current lack of unanimity about whether to sue Heidgerken, Moore said the public partners are all fully committed to seeing the riverwalk built, no matter who owns the property. "It's not a matter of if; it's a matter of when," Moore said. To date, roughly $2 million has been spent by the public partners on the design process, which included Heidgerken's sole contribution so far of $200,000. Moore said the funds have been "well spent" in setting the framework by which a riverwalk eventually will be built. This story has been updated from its original version online to reflect the fact that Heidgerken actually does not have the right to decline signing permit applications. Metro was trying to make clear that the only thing Falls Legacy LLC could do for sure to hold up the project is withhold signatures on permits. The easement agreement Heidgerken signed in 2014 requires him to sign the permits. Page 6, Section 11 "Permit Approvals," states "Metro may apply for and obtain land use approvals, building permits and designations for the Riverwalk to construct the Riverwalk. Grantor shall cooperate with Metro in applying for and obtaining such approvals and designations by, for example, prompt execution of applications and similar documents. If, as a condition of Metro's land use approvals for the Riverwalk, Metro is required to construct infrastructure improvements that also benefit the remainder of the Grantor Property, such as traffic improvements, Grantor shall contribute an equitable share of the fees, costs and expenses of such improvements, as agreed upon by the parties."